I had to read the spec sheet a few times, but only had to drive the car once to know that the words "sport" and 148 horsepower are not synonymous. On the hills in our Home town of Pittsburgh this was not the vehicle of choice to get around in a fun fashion, most regrettably. Middling to slow. 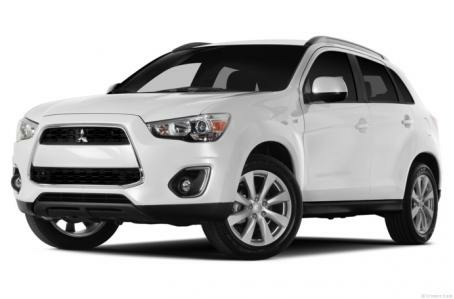 The 2.0 liter, 148 horsepower four simply does not have enough oomph for the Outlander Sport. Does well enough though on the road as long as you don't ask for swift, faster acceleration or drive up hills. 24 city and 29 highway, with the median at 26. Very nice mpg - that is the flip side of how light it is. 24/29; better than most to all of the competitors to this car. This is the category in which the Outlander Sport shines brightest. Annual fuel cost is $2,050 a year based on 15,000 miles of driving and gasoline prices of $3.55 a gallon. Mitsubishi has done well with this vehicle in its design and improvements. Again, the unfortunate thing for women with children and families is the compact rear. The 60/40 split seats are easy to maneuver. At its price point I don't know how it competes head to toe with other rivals that have superior handling, and get up and go. The other disturbing aspect is the choice of materials Mitsubishi uses... the tough points feel inexpensive and chincy. 18" alloy wheels provide a definitive look and road control. It's a really well styled, well equipped value packed small SUV. Ruggedly built, the Outlander Sport doesn't get a lot of love from mainstream press, which considers the Outlander Sport to be slower than it should be, and behind the eight ball in several ways as well. But we don't agree with the automobilistas. It handles quite well in urban settings, has more equipment for the price than the competition, too. Very good safety features on the Sport including: Advanced Front Air Bags, Front Seat mounted Airbags, Side Curtain Airbags, Active Stability Control, Tire Pressure Monitoring, Latch for Children, Anti-Theft Device, Disc Brakes, Independent Suspension, Hill Start Assist. Requisite air bags, front and rear and side, hill start assist, and the usual other safety pieces. USB port and Bluetooth for hands-free driving, the Rockford-Fosgate stereo is a nice jamming touch, heated front seats, a NAV system with a backup camera and a 40 gigabit hard drive. The panoramic roof offers a clear view for all. That price includes quite a long list of standard equipment. Four wheel drive, full power accessories such as steering, brakes and windows, rear LED taillights, 60/40 split fold down rear seats brake energy regenerating system, fully color multi information center, 18 inch alloy wheels, one touch start/stop engine ignition switch, heated front seats and side rear view mirrors, rear privacy glass and on and on. Our options included a navigation system, that panoramic roof, a 710 watt Rockford Fosgate punch premium sound system with nine speakers and a choice of settings form normal, to concert hall and in between and plenty of other goodies. Final price was $28,570, but we suspect that you can get a pretty good deal on this car that will save you considerable bucks on that price. Not that we consider that price to be high--in fact it's way reasonable considering what you get and what the competition costs. Styling and design is updated and Mitsubishi-esque. Bolder front grill and contoured body offer excellent looks for this 2013 model. It just looks like a ball of fun. Aggressive stance, wheels pushed out to corners of the car, tough looking grille and ambiance add to the fun of this car. 10 years, 100,000 mile powertrain warranty, a 5 year, 60,000 mile limited overall warranty, and a 5 year, unlimited roadside assistance plan. The car is covered by a 10 year/100,000 mile powertrain warranty, a five year/60,000 mile limited overall warranty, and a five year/unlimited roadside assistance plan, along with a seven year/100,000 mile anti-corrosion/perforation warranty.